Spirit has given us so much to share, we are overflowing. It gives us great joy to pass on these gifts to you in Work/Playshops where we focus on connecting as deeply and as openly as possible in order to receive the love and support needed to change and grow. Our job is to “hold the space.” That means we energetically provide an unconditional atmosphere for all to give and receive what they most need, freely- without judgment of any kind to limit us. As we hold the space, we become conduits for Spirit and its direct guidance. Then everyone (including us) receives what they truly need, beyond our current understanding or ways of thinking. We support and honor those needs with all our hearts. With constant listening to our Spirits, each Work/Playshop is custom designed for those who come. That’s why we cannot always tell you exactly what will happen each moment, in advance. We hold the space for complete co-creation with Spirit which continually moves and grows in every now so that all present can be perfectly served (as their needs change and grow, constantly, also). We prepare for these Work/Playshops by living our true choices every day. This puts us in the exact place to serve whomever assembles in these groups. We ask you to do something similar. A few days before a work/playshop we invite you to open your heart and meditate upon our theme. It will begin speaking to you, as you wish. By the time we gather for the work/playshop, you will be ready to receive the deepest level of support that your Spirit can offer you. We will offer you the most respectful space possible to receive these gifts. In such an intentional gathering, anything is possible. Just our saying this brings up fears for many people. We welcome that, we embrace that. Life is an unlimited spectrum of potentials. We choose for these Work/Playshops to reflect that unconditionally, so that you can discover your most amazing potential- the one that is so incredible that you didn’t even know how to imagine it, until it showed up! In order for you to find this amazing self, you may have to go through old fears or limits. These could be subconscious voices from your past that just didn’t believe in you enough. They could be holding you back, and you may not even be aware of them. This is why we ask you to prepare yourself in advance; this encourages you to be ready to release these fears if that is appropriate for you. Check the "Upcoming Trips and Events" page for postings of our confirmed schedule for you to consider. We love working with the Elementals, the devic Spirits of the elements—Fire, Earth, Water, Air and Ethers. Everything on this planet, including her, is made up of these elements in some perfect, magical alchemy that ever dances to release blocked energy and to create form. The moment before you are born, the Elementals imprint you with a particular combination of the elements. When you know this imprint and its energetic qualities, you can feel that pre-birth moment and spontaneously remember your perfect union and wholeness. Yes! In this workshop, we will listen with our Spirits for your EBI and share how those Elemental qualities continually affect your life and your choices. Learn your Elemental Birth Imprint and unconditionally understand your true self. Find out how to use the innate gifts and magic of your EBI. Attract the most supportive people, work, play, service, events, etc., with the blessings of the Elementals. If you have never received your EBI before, come prepared to absorb (and write down) core wisdom that can empower you in any moment, in any situation. If you already know your EBI, let’s put its magic directly to work! Bring your challenges and visions and dreams and we will offer Elemental practices and transformation to any area of life that you wish. Rituals of Manifestation Workshop Now! We are living on the cusp of the end of one Earth Age, growing into the bright, powerful beginning of a new Earth Age. What’s utterly amazing about this new Age is that the Earth Mother, herself, is jumping into a never-before-seen, quantum-leap evolution, that automatically invites we humans along for the ride of many lifetimes, now! Perhaps our greatest challenge is that all the amazing tools that our species has depended upon for millennia may no longer apply: They cannot necessarily keep pace with the Earth Mother’s vastly shifting vibratory rate. That’s why our Spirits asked us to co-create the Rituals of Manifestation Deck—52 living, breathing, inspirited, Cards/Rituals that integrate us timelessly with all times and all transformation. Rather than simply divining our future, the Rituals rightfully ask us to CO-CREATE the future of our free, loving choice, now, with the new, evolving vibrations within us and around us! From the first moment we listened and spoke with: Sprites; Gnomes; Stars, Crystals, Plants (and more), they kindly invited us to change our diets, so that we would always have exponential lifeforce to listen, to speak, and to co-create miracles with them. They guided us, step by step, refining our diet perfectly from vegetarianism to our current bliss: Live Foods. Live Food is organic, raw, vegan food that has never been exposed to more than 108° F, which preserves all the minerals, nutrients, enzymes and innate loving gifts of the Plants. When you take in this fuel, you receive pure prana— more lifeforce energy than your mind-alone can ever calculate. Once you activate prana, you will heal things in your life (often subconscious) that have been “stealing” your precious lifeforce in each breath: addictions; co-dependency; stagnation, toxins, distractions…and anything you use to fuel that negative foundation, like processed, deadened food/thoughts/habits. When you change your fuel, you spontaneously and profoundly change your life. What magic would you do with that much extra lifeforce now? o How Live Foods can transform your life and fuel miracles. Hi hi hi hi! If you’re reading this, we’re might even be on the road to YOU, and while we’re doing workshops in your area, we also will be doing readings to support you welcoming in the guidance, perspective, and freedom to act upon the many, many ENLIVENING choices available to you, now (and when not on the road are available by phone!). Yes! Now you know why we’re excited!!! For us, intuitive readings (and actually, we call them, listenings—listenings with our Spirits that we share with you upon your respectful request) don’t mean that we know any more than you. They don’t mean that we have your answers. We simply offer them for what our SpiritGrandmother calls “just the gift of another perspective that you might not have easily found otherwise,” and in our lives, we have found that Spirit perspective is beyond any other support that we can find. It guides beautifully, whether we agree with it or not. It supports us with other wisdom even if we don’t understand it. Whenever any of us freely opens our heart to another view, it always gives us a gift….it inspires us in some way— all we have to do is look for it. After all, in our lives, we all (consciously and subconsciously) attract whatever we truly need— whatever our bodies and souls ask us to look at in order to heal…grow….transform and then PROSPER as we are destined to do and be. Of course. Dare we say it?.....As listeners, we are happy to offer you any kind of respectful listening that you would like— whether we bring it to you in person, or if you schedule a phone or email reading from us anywhere, any time. Special needs? Special requests? Let us know as soon as possible what you are imagining so that we can listen and prepare and be ready for exactly what serves you. This is the most core, the most immediate and the most all-encompassing listening that we know how to offer. We are so grateful for being gifted this system by Spirit and the Elementals. Every human is imprinted by the Elementals (the Devic Spirits of Earth; Fire; Water; Air; and Ethers) just a moment before they were born. Once we leave our mother’s womb, we enter the world of “separation.” Yet, while we are still in utero, we are still breathing water and knowing more union with life than anything else. The Elementals mark that precious moment for us, in their language: an Elemental Birth Imprint. Once you consciously know your EBI, you connect back to that simple acceptance and belonging with all life. It’s a unique gift that lights up every part of your being. Want to know more? : Check out the Elemental BIrth Imprint Page of this Web Site. We share it all with you there. We highly recommend this listening. It has deeply touched everyone who has ever experienced it, and we would love that to be you, too. When we first saw auras around people, we were gloriously stunned— in awe. What Light Shows we all are!!! Our Spiritfamilies tell us that our current human technologies are still too fixed, too structured linearly-alone (instead of allowing constantly shifting geometries, which is actually the movement of all natural life on the planet) to be able to pick up all that our auras have to say about us and about life as it is evolving, moment-to-moment (although we also now have an extremely advanced Russian gas-discharge-visualizaton machine that is a massive evolvement of Kirlian photography that does allow us on the computer to show you your energy field). You’re in luck: Have crayons, will travel! While we are not ARTISTS, we are so pleased to draw your aura the way it shows itself off to us. Then we will talk about it and translate those moving colors to you, as you wish. And if you have specific questions about your life, then they can also be welcomed into this format after we have listened to your aura. It simply gives us a great, simple (visual!) place to connect and to learn and grow with, together. Plus, you’ll get to take the drawing with you, so that you can refer to it anywhere any time: Keep up an ongoing conversation with it yourself! This is a wonderful way to let your bodies speak with you in the moment and can truly support you in then acting upon that wisdom. It is also quite supportive to link together as cycles multiple Aura Drawings to affirm your healing movements and further invitations from your own bodies/Genius Brain. Our life has been incredibly blessed and expanded in every way by listening to the timeless wisdom of the Stones (the Earth’s recordkeepers of every event, feeling and thought). They have always taught us to say, "Yes!" If you want to gather in a wide-open Workshop and feel what it is to hear the Stones in ways that you never heard before, join us. We’ll listen to Stones together. 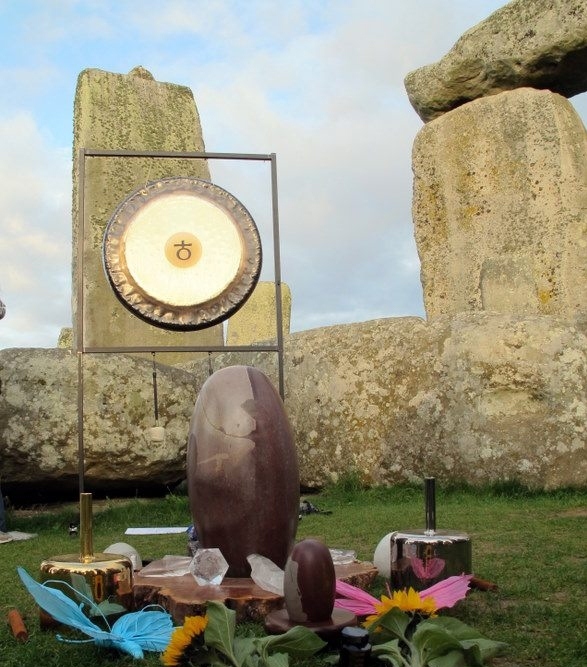 We’ll share stories of how the Stonebeings have shown us how to manifest clearly, spontaneously and magnificently. Let’s explore what Stones speak with you. and how you can apply that wisdom to every area of your life, exponentially. It IS magic. Of course. And, in using the Stone combinations from the book series, “Stones Alive!” we uncover the natural manifesting support of the energy of Stones. In this Work/Playshop we explore their energy in many levels, so that our bodies can call upon those resources, when needed, and expand upon them. To learn from the Stones is to learn how to manifest elementally and in union with all the other respectful Kingdoms already doing so here on our beautiful planet. The reading/consultation can take any respectful, loving form that all involved, choose. Elemental Birth Imprints- With your permission, we listen for the exact combination (and percentages) of the imprint that the Elementals (the Devic Spirits of Fire/Earth/Air/Water/Ethers) danced upon your body and soul, the second before you were physically born— when you were still living in the “union” of your mother, and life, and body/Spirit. Are you Fire & Water? Are you an Earth EBI? Your Elemental Birth Imprint tells you how you move in the world— at the core, at the level BEFORE personality. When we can freely connect to that wholeness, what couldn’t we do and be? Issue Specific Listening- Come with whatever struggles you have and when you are ready to leave them behind (Yes! ), we support you so fully, so utterly, that they can transform in a moment, a breath. We do not fix anything for you.....we’ll do much better than that: We will listen with your Spirits to go to the deep, unresolved wounds at the core (which are always at the base of our stubborn blockages) and we will fully support you embracing them yourself. Once we unconditionally accept our unresolved traumas, they shift. Instantly. Magnanimously. Inexplicably perfectly. Business Consultations- Looking for work that truly fulfills you body and soul? Want to open your own business? Want to grow the business you have? We’re here. In our life, we intertwine our work, our play, and our life and we love to explore ways that you can grow those parts of life in pure abundance and joy. Astrology Listening (We need to get your birth data before scheduling this reading)- We like to listen to how the Stars reflect the biggest pictures of your life, your path and growth. Astrology is the language of how everything relates to everything else. The opportunities for new, unjudging perspective and potential are limitless. Yes!